Rudere is located in a quiet rural area with a great panoramic position, within easy drive of the town of Lauria. It offers the potential to create a two bedroomed main house and another two bedrooms in a separate guest house. Living space: The two houses will be created from two existing stone buildings which are currently derelict. The asking price is negotiable. 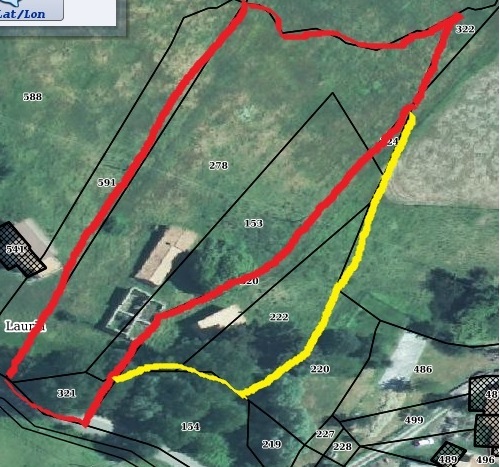 Possibility to buy the adjacent property (marked in Yellow). Main house: Reception room, two bedrooms, one bathroom, outside patio for summer eating and living space. Outside: The property benefits from a commanding position and stunning views. Included in the asking price approximately 12000 sqm of land. The main house has an electricity supply but this is currently disconnected. There is a private water supply from a well located on the property. It is possible to connect to mains water. Drainage to be provided. The main house requires structural work including re- roofing. The interior will be styled to suit the requirements of the client. j) Permanent or removable green house.